Since VR goggles have… hopefully… already reached peak ridiculousness, his first idea was to glue a Leap Motion controller to the front of it. It couldn’t look any sillier after all. The Leap controller was designed to track hands, and when combined with the IMU built into the VR contraption, did a pretty good job of putting his hands into the world. Unfortunately, the primary gesture used for a “click” was only registering 80% of the time. The gesture in question is a pinching motion, pushing the thumb and middle finger together. He couldn’t involve a big button without incapacitating his hands for typing. It took a few iterations, but he arrived at a compact ring design with a momentary switch on it. This is connected to an Arduino on his wrist, but was out of the way enough to allow him to type. It’s yet another development marching us to usable VR. We personally can’t wait until we can use some technology straight out of Stephenson or Gibson novel. During a recent project, [Fabien] realized he had forgotten to add a piezo buzzer to his project. All of the other pins were in use, though, so his goal was to use one of the input pins to handle button presses but to occasionally switch to output mode when the piezo buzzer was needed. After all, the button is only used at certain times, and the microcontroller pin sits unused otherwise. After a few trials, he has a working solution that manages to neither burn out itself nor the components in the circuit, and none of the components interfere with the other’s normal operation. While it isn’t the most technically advanced thing we’ve ever seen here, it is a great example of using the tools at your disposal to elegantly solve a problem. More than that, though, it’s a thorough look into the details of pull-up and pull-down resistors, how microcontrollers see voltage as logic levels, and how other pieces of hardware interact with microcontrollers of all different types. This is definitely worth a read, especially if you are a beginner in this world. Reading from a large number of inputs, like this piano keyboard, can be tedious. Even when multiplexing there’s a lot to keep track of. But if you choose the right microcontroller, you may have hardware assistance. 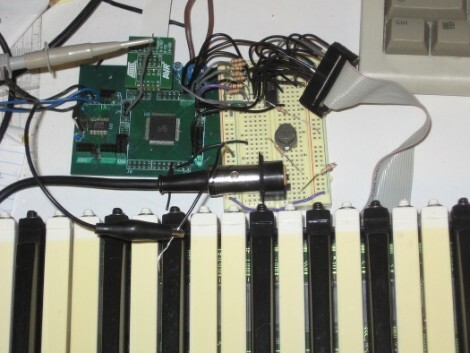 Here’s an ATmega640 is using it’s external memory interface to read the key matrix. You may remember the Open Music Labs article about reading from a shift register using just one pin of a microcontroller. This time around a shift register is still used, but instead of pulling in a long line of parallel inputs, the switches are multiplexed to reduce the number of I/O pins used to read them. A 74HC573 is used to facilitate the multiplexing. We won’t go into how that part is accomplished; there’s a separate post that explains the process. What’s unique here is that the XMEM peripheral of the AVR microcontroller is used to grab the data. This is intended for external memory chips, but if you get the timing just right, it greatly simplifies reading in a matrix of up to 128 inputs. Here’s an interesting article about reading data from shift registers using less than three pins. 74HC165 shift registers are a popular choice for adding inputs to a microcontroller. They have a parallel input register which can be read using the latch, then shifted into a microcontroller via the data and clock pins. For those counting, that’s the three pins normally associated with driving these devices. 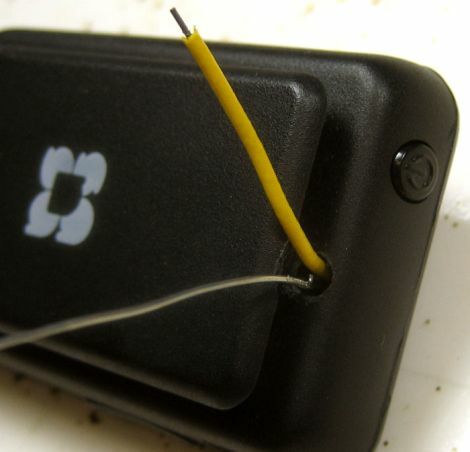 This hack first does away with the latch pin. The addition of a carefully trimmed RC circuit (capacitor is charged by the clock pin, then the resistor lets that cap slowly discharge) means that the device will not latch until after the clock stops toggling. This technique drops the control down to just two pins (data and clock). You can still use hardware SPI to read the data using this method. It’s the same as using SPI to drive 595 shift registers except the microcontroller reads data instead of writing it. But wait, there’s more! 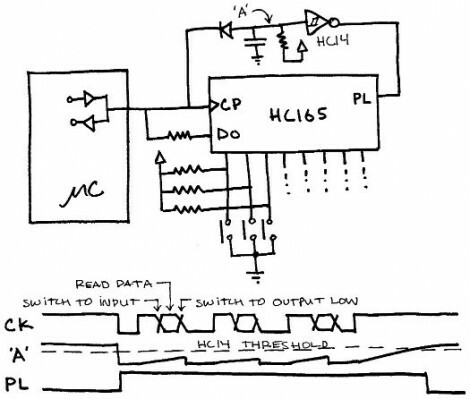 The diagram above actually shows a way of reading this shift register with just one pin. 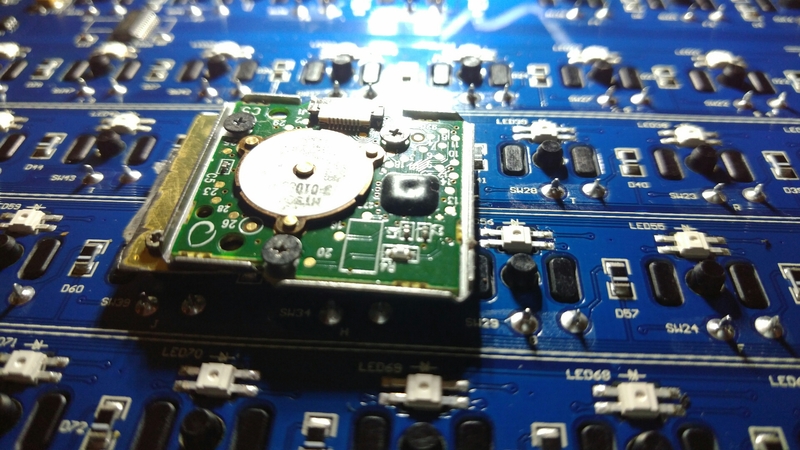 Notice that the clock and data pins are now connected to just one of the microcontroller pins. The data pin has an added resistor, which keeps the current low enough that it will not compete with the clock signal coming from the microcontroller. In between clock pulses, the microcontroller switches from output to input to read the data pin on each cycle. Give it a try, it’s a fun experiment! Workshop 88 member [Jim] got his hands on a couple of SanDisk Sansa Clip+ MP3 recorder/players from Woot, and was anxious to see what he could do with them. The first order of business was to install RockBox, an open source hardware package built for a wide range of MP3 players. He was impressed with how robust the firmware was, though he thought the Sansa’s built-in microphone could use a bit of upgrading. Acting on a tip from a fellow square dance enthusiast, he disassembled one to see how he might add an external audio input. He pried the existing mic apart, and desoldered it from the motherboard, installing a small capacitor and resistor in its place. He extended some wires through the case, then powered up the unit to make sure it was still alive and well. Since things still looked good, [Jim] put some audio on the Sansa’s new inputs and sure enough it recorded the audio without a hitch. He says that his initial guesses for the capacitor and resistor values were pretty decent, though with a bit of tweaking he should be able to get exactly the recording levels he was looking for. Not bad for a $20 audio recorder!